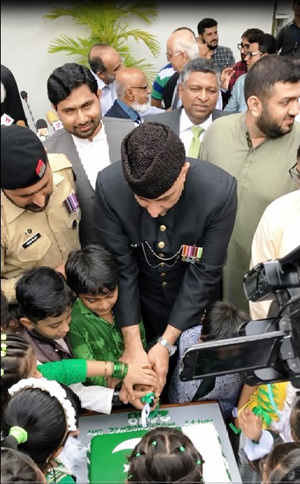 The High Commission of Pakistan and the Pakistani community based in Sri Lanka celebrated the Independence Day of Pakistan with national zeal and enthusiasm and the commitment to protect the country against perils. 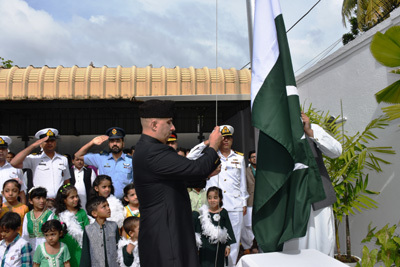 The Acting High Commissioner of Pakistan, Janbaz Khan hoisted the national flag in a distinctive ceremony held at the High Commission premises on 14th August 2018. On Pakistan-Sri Lanka relations, the Acting High Commissioner said that Pakistan had established diplomatic relations with Sri Lanka, immediately on her independence, in 1948. Since then these relations, which are based on mutual understanding and common interest, have flourished continuously. He underscored that Pakistan has always supported Sri Lanka in her quest for national security, promotion of democracy, rule of law and economic progress. He also conveyed Pakistan’s best wishes for peace, unity, harmony and progress to Sri Lankan Government and her people. The ceremony was attended by a large number of participants from various walks of life including members of the Sri Lanka Pakistan Friendship Association, Sri Lanka-Pakistan Business Council and the Pakistani community based in Sri Lanka.